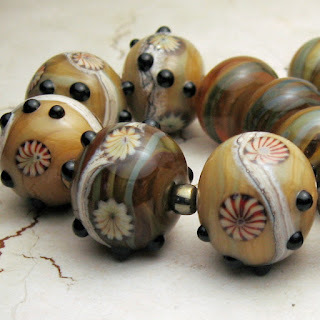 While at the ISGB Gathering last July I purchased 2 cabochon mandrels (among other goodies. I am having a ball making these cabs! Although I am not a silversmith, I am a seed beader. I had alot of fun with this bracelet made in freeform peyote stitch that incorporates my cab along with freshwater Keishi cup pearls (love them! )Swarovski crystals and lots and lots of seed beads.If you've never made one of these and are looking for instructions, Sherri Serafini has several online instructions, including one on Fire Mt. Gems website. My next challenge will be ovals. This coming weekend I will be selling my wares at the Heart of California Bead and Adornment Expo in Fresno, California. The event is on Saturday and Sunday, September 22 and 23 from 10:00 to 5:00 both days. 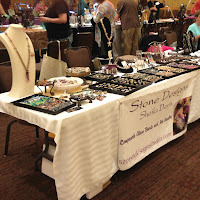 I will have LOTS of beads including sets and focal as well as unique glass jewelry components like clasps, bead cones, head pins, slider rings, disks,glass leaves, bobbins, vintage skeleton keys with a bead on them and adorned with Swarovski crystals, Auntumn leaves, pendants and more! Here's a link to the Facebook page for this event: https://www.facebook.com/HeartOfCaliforniaBeadExpo See you there! 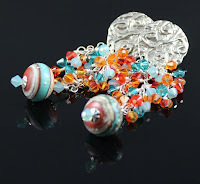 Today is the big reveal for Lori Anderson's Bead Soup Blog Party 6! My partner Karin von Hoeren from Germany http://www.creativeideen.de/sent my bead soup which included the beautiful beaded bead focal she made. I decided to make 2 pieces of jewelry, one with the beaded bead as a focal and a bracelet made with the cute wreath toggle clasp. I used one of my lampwork glass beads as the focal in the bracelet and some of the creamy white pearls Karin sent.this bracelet can go from Fall right into Christmas! I had fun making the necklace. As a full time lampwork artist, I don't take the time to work with seed beads like I used to...and I realized how much I miss it when I made the spiral rope for this design. I added some of the beads from Karin, a few Swarovski crystals and one of my lampwork beads. The challenge was trying to attach the bead wire without adding a clasp. Can you tell where I crimped it together? I attached the beading wire to the seed bead rope inside the gold bead cones. The 2 wires are crimped together at the top next to the bead cone on one side. A matching gold ball on the other side balances the crimp cover. Be sure to check out all the other participants in the Blog Hop. Again, thank you Lori for all the work you put into hosting this event. And thank you Karin for the beautiful beads! One of the things I love about working with glass is all the possibilties. I recently purchased 2 cabachon mandrels and am having alot of fun with them. They are easier to use than I thought too! The uses for these cabs is endless. I am currently working on a beadwork bracelet with the cab as the focal. Another idea I'm working on is glass rings. I've made a couple but need to get the proper mandrel for that too. Again...so many possibilities. 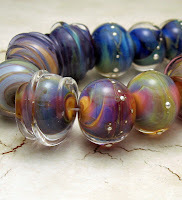 Here's a picture of my Bead Soup from Karin von Horen all the way from Germany. She made the beautiful beaded bead. 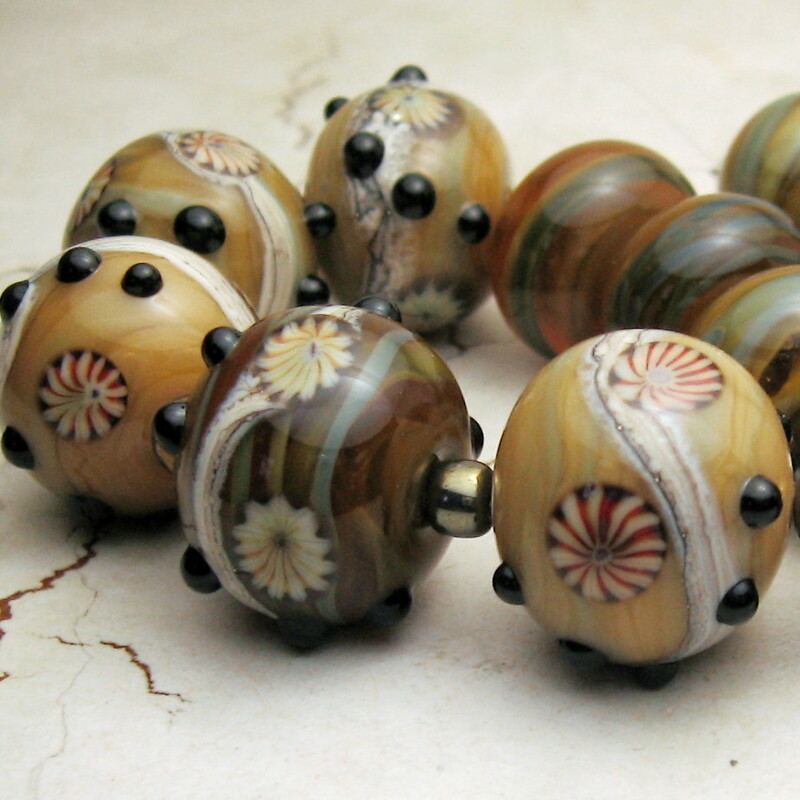 Now to come up with a worthy design for the focal bead. Since I'm a seed beader also I'm thinking I should use a spiral stitch or something like that to coordinate with the bead. I already made a simple bracelet with the wreath toggle and one of my floral lampwork beads in red. 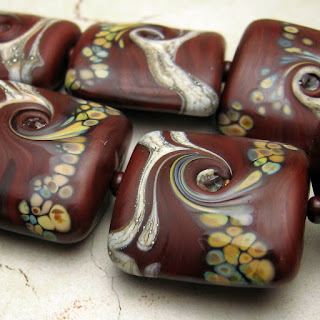 August 25th is the Reveal date for these and many more designs from Lori Anderson's Bead Soup Blog Party. So much going on this time of year, I can't believe it's been almost a month since I blogged! I had the most wonderful time at the 20th annual ISGB Gathering. Exhausting...but fun. I learned alot, met new friends and reconnected with a few. The hotel was very nice, the food was fantastic and the lectures very insightful. Had alot of fun at our Lampwork Etc. bead exchange too, and got to try Vegamite for the first time....yuk! (thanks Deb! )This is a picture of my booth at the Bead Bazaar. Win a Set of Letter Stamps! 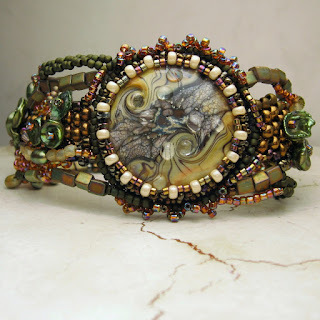 Jewelry and Bead Soup Blog Party guru Lori McDaniel Anderson is having a giveaway on her blog for a set of Impress Art Letter Stamps and a stamping hammer! Here's the link to her blog so you can enter to win! I've been wanting to try my hand at some more sophisticated metalwork and I think these stamps would be so much fun and the perfect compliment to my lampwork beads. 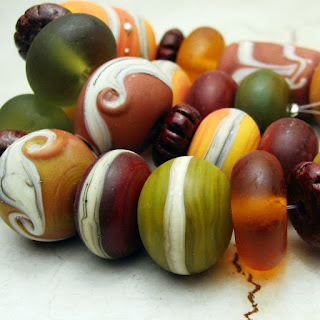 There has been alot of discussion in the lampwork community about SRA handmade lampwork beads versus mass marketed lampwork beads.The letters stand for Self Representing Artist and is comprised of a large group of individuals who make the beads in their home studios. Being an SRA member means they are selling the beads they made and pay close attention to detail with every bead from making the bead, properly annealing the beads and cleaning them of all bead release before selling them. 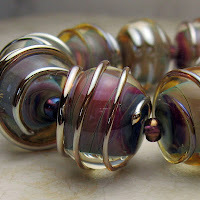 When shopping for lampwork beads, try to search for SRA artists. To learn more about this group or look up the members list, click on the link below. After a year long journey to create my own website (long story) I finally have my own website! It has lots of pictures of my beads and jewelry and even a cool slide show in the gallery section.Check it out and let me know what you think. I love it when a customer takes the time to let me know what they have made with the beads they purchased from me. 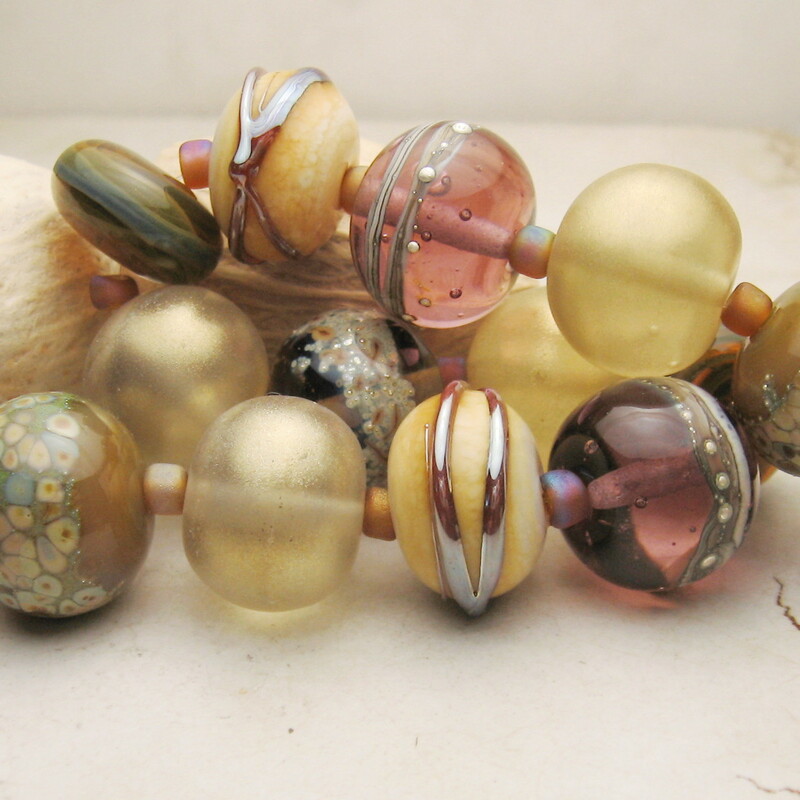 This adorable bracelet made by Diane Scott combines one of my lampwork lentil focals with seed beads and assorted Czech glass beads and pearls. I love it!! Here's another bracelet my niece, Lisa Suver made with one of my lampwork "orphan" beads. I just love it! Be sure to check out all the participants of Lori Anderson's Bead Soup Blog Party going on today! I often include one pretty lampwork bead as a thank you gift when people purchase beads from me. 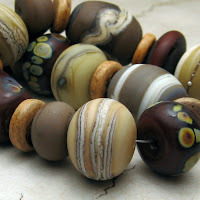 I want to suggest a few design ideas using one bead. 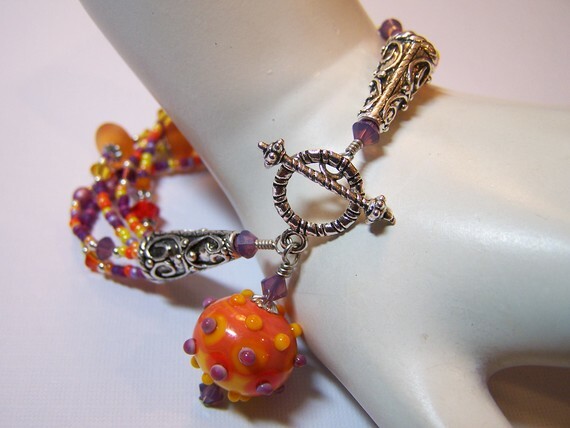 First...here's a link to my nieces adorable bracelet made with one of my lampwork beads. 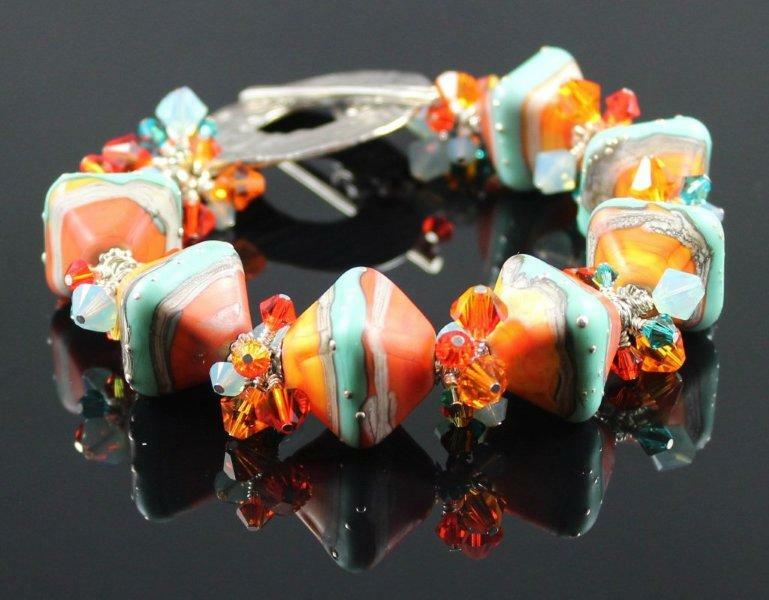 She has made a cute bangle style bracelet with the bead as a focal and coordinating beads on each side. Some other ideas include making the popular purse charms. Use a large lobster clasp and make a dangle with the bead and some coordinating crystals and metal. The same can be used for key chains, zipper pulls on clothing, diaper bags, backpacks even fan pulls and mini blind pulls. Use in a mixed media designs for an eclectic look that's so "in" right now. Of course, one beautiful handmade bead makes the perfect pendant, adorned simply and strung on a chain, leather cord or satin ribbon. Well, I wasn't chosen by the randomizer for the Bead Soup Blog Party..but my niece, Lisa was! Conrats Lisa! I can't wait to see what her and her partner come up with. I like Lori's idea too for those who weren't chosen. Here's a link to her popular blog to find out how it works!